What a delightful treat for the fall with this refreshing pumpkin spice ice cream. This also takes on the characteristics of pumpkin pie with a little bits of chocolate and crust. This delicious confection will surely bring a smile to all that love pumpkin. The best part about it is, that you will now be able to make the recipe all year long. Of course, waiting for fall will make you look forward to this treat in those cooler months and certainly put a smile on your face. I like to save certain flavors that remind me of spring, summer, fall or winter, to make the seasons more special and make those treasured recipes those times of the year. 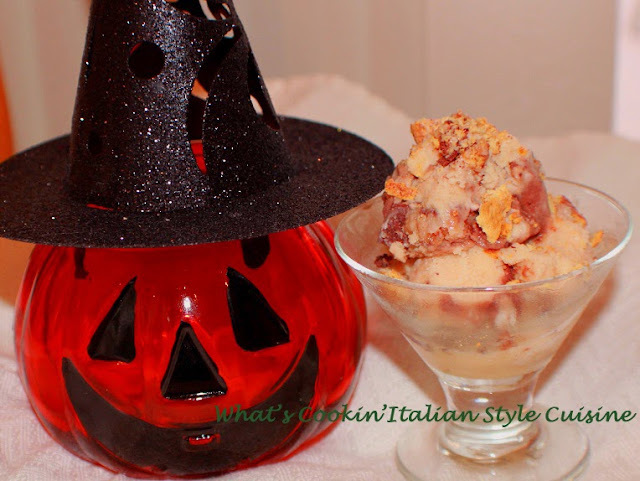 Give this a try you will be pleasantly surprised as it is truly the best pumpkin ice cream I have ever imagined and it goes along famously with a piece of pumpkin pie for the Holiday! If you must use the old fashioned stir method and don't own an ice cream maker, no problem! Have patience and stir every 15 minutes when placing in your freezer container. Freeze and keep stirring until smooth and set, it takes a lot of stirring to be super creamy. This one is done in an ice cream maker and so worth the investment! 1 cup crumbled cinnamon graham crackers. In a large bowl whisk together the sugar, milk, brown sugar and molasses, for around 3 minutes. Add and whisk in the puree, spices and vanilla. Pour in the heavy cream and blend well. Place in the ice cream maker. Let churn for at least 25 minutes then check, I taste it, sometimes takes 30 minutes or according to the directions on your ice cream maker. Scoop in the ice cream into your container and layer with chocolate and graham cracker filling into a freezer container alternating ice cream then the chocolate and crumbled graham crackers ending with ice cream. Smooth over. Freeze for at least 2 to 3 hours before serving. More recipes for ICE CREAM?